The IMYC Yacht racing schedule and format will be announced by the Race Committee via e-mail, FaceBook, and Web site.. The Racing Schedule will specify racing dates, individual regattas/series/combination, trophies, handling of delayed or postponed races, skipper’s meeting details and any other necessary information. Make up races and reschedule will be scheduled as needed. UNLESS OTHERWISE STATED, SKIPPERS MEETING ALL SATURDAYS AT 10 AM!!! Contestants will receive 1.5 points for each first place finish, 2 points for second, 3 points for third and so on. The winner is the contestant with the lowest point total for the event. In the event of a tie, the lowest total corrected time will determine the winner. The Cup Races (at least 2 per year) are scored separately from the Fall and Spring Series). All skippers should hail for their rights well in advance of any disputed situation. Any yacht which acknowledges her foul may exonerate herself by completing a 360-degree maneuver immediately after the foul, but not before she has started. Protests must be presented in writing to the Race Committee within 30 minutes of the return to dock of the acting race committee chair in order to be considered valid. Hitting a buoy will also require ONE 360 deg. turn. IMYC will use the Time Correction Factor (TCF) system for determining corrected finish times and scores. The starting values will be determined based on standard IMYC PHRF handicaps and calculated such that in average wind conditions the results will be the same as PHRF. The difference is that the TCF will increase the time difference on slow, light wind race days and decrease the difference on fast, windy days. Adjustments will also be included for sail area, fixed props, etc. as described in the Ratings Adjustments section. TCFs may also be adjusted based on a boats performance as the year progresses. A boat's Captain will be notified of changes to their respective TCF. These changes will be based on TCF calculations and the discretion of the Race Committee. 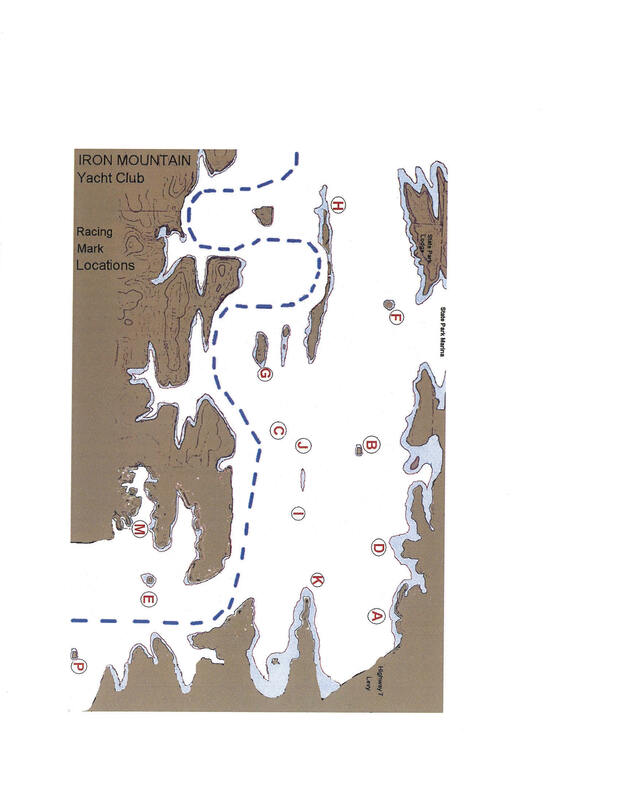 Consider this encompassed in the IMYC PHRF handicaps. Time limits and cancellation or postponement for weather conditions will be at the discretion of the race committee. The only allowable source of energy for propelling a yacht through the water shall be the wind. Section 50 of the Racing Rules is modified to allow ANY means of sail attachment, placement, and sheeting, so long as the wind provides the only source of energy. 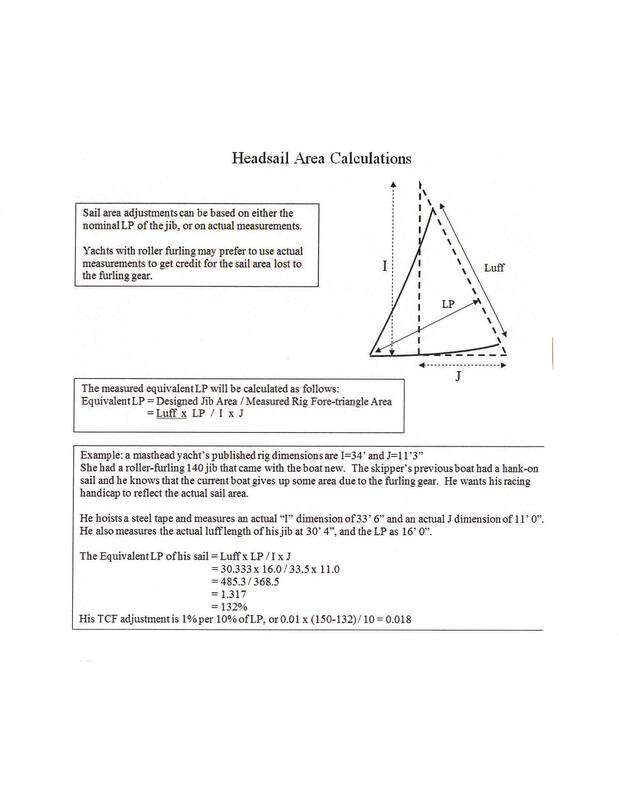 Mark rounding will NOT be an integral part of finishing. When a Mark forms one end of the finish line, the final leg shall extend from the last Mark directly to the finish line. All boats are asked to have an atomic clock aboard in order that all boats are syncronized together on time. The start time will be given via radio. The Honor system is invoked!!! Each boat is responsible for recording their finish times. The course and any other necessary information for each race will be given at least 5 minutes before the start of each race via radio. VHF channel 71 will be used when possible to aid in race related communications. 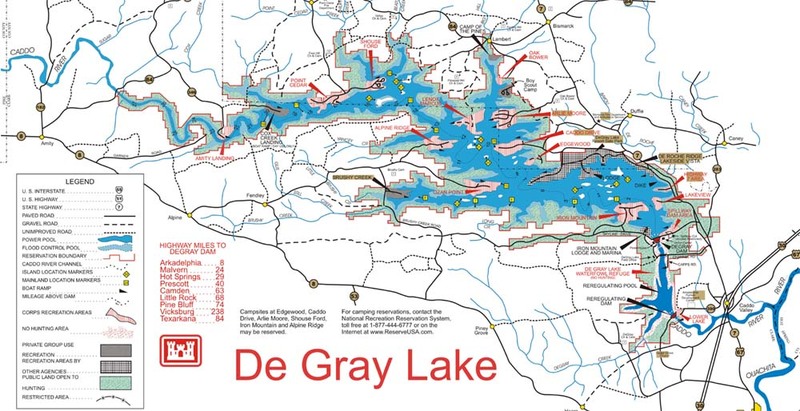 Note the Map of Lake DeGray below with the buoy marks indicated. All Participants should have a map onboard. Ask the Committee Guy.